Dicuss puzzle hints, methods, answers, and solutions. Example Google interview questions and puzzles. My email: solvepuzzles@gmail dot com. Pipe Spin: Spin the pipes such that all pipes become green. Rules: One pipe has a "water source" (colored green), and anything connected to that pipe also gets water. To win, all pipes must be connected. On harder levels, pipes may "wrap around" (connections above reconnect to connections below, and same for left-to-right). To win, all pipes must get to the "water source". How to Play: Click on a pipe to rotate it 90 degrees clockwise. 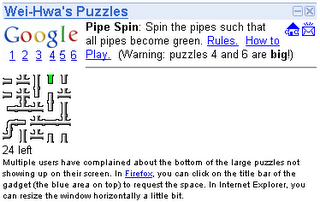 After choosing a new puzzle, you may have to resize your browser window a bit to force the refresh. Answers are usually (and will be) posted in the comments section. Full answers will be posted on the solvepuzzles page. I will post the solutions later. Are you a puzzle lover? Are you solving Wei-Hwa's Puzzle Challenges? 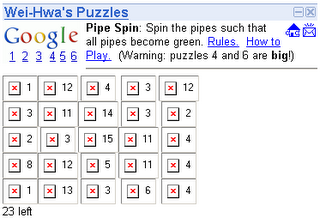 To add the puzzle module, click the Add to Google button below. If you have hints, answers, and solutions to the problem, email me at. A break from puzzles. Not!